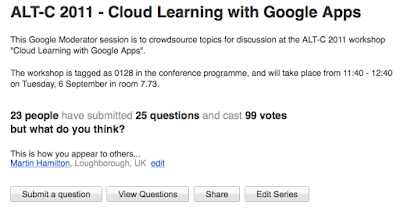 In this post I'll pull together the key themes that emerged in our "Cloud Learning with Google Apps" workshop at the ALT-C 2011 conference. I was pleased that we had some 70 attendees express an interest in this session, making it one of the most popular parallel sessions at this year's ALT-C. Unfortunately we only had seats for 50 people, so my apologies to those attendees who had to stand, sit on the floor etc! Ross Mahon and Grainne Phelan from Google had already warmed up the ALT-C plenary audience with a five minute elevator pitch describing the key features of Google Apps and encouraging the community to engage with Google. This workshop followed up the elevator pitch, and gave ALT-C attendees the opportunity to both quiz Google and share details of their own educational use of the Google technology. To kickstart the discussion, we had a a short video (embedded below) from Mark Allen of Ed in the Clouds. Mark's consultancy provides advice and assistance on cloud computing for schools. When watching the video, try to bear in mind that Mark's school pupils are the undergraduates of 2020. Will secondary and further/higher education live up to their expectations? I hope so! 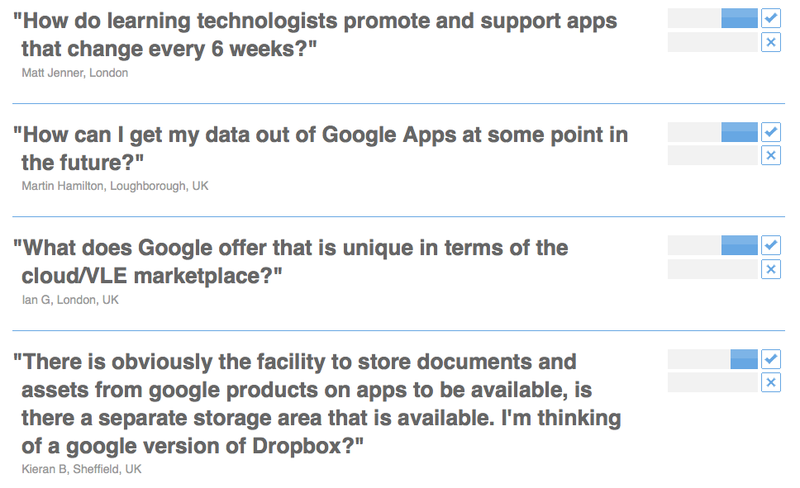 William Florance from Google stated that he would like to collect together case studies around educational use of their tools, and will be holding a competition later this year to encourage people to share examples of what worked for them. Google+ (G+), Google's new social network - with social networking extensions to most Google products also in the pipeline. 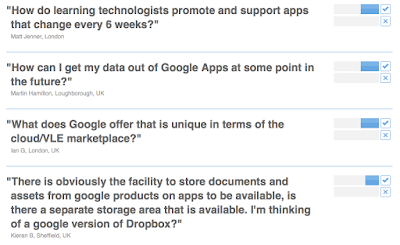 We are looking forward to testing G+ integration with our Google Apps domains, hopefully this Autumn, and building upon the upcoming G+ API. 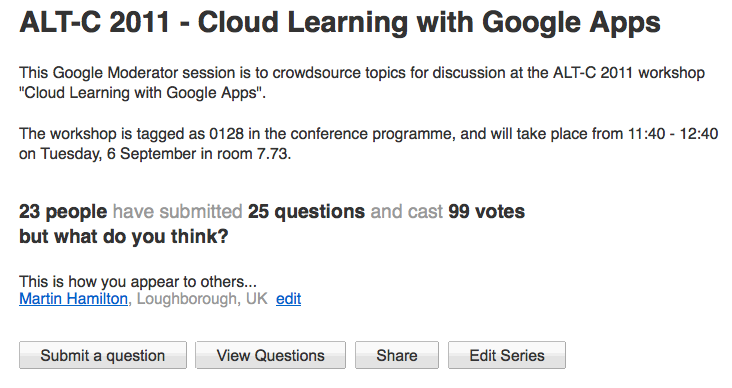 The presentation below gives some ideas about how G+ might be used in a classroom context. However, watch out: there seems to be a popular misconception that Circles in G+ can be used as "groups", in the same way that Google Groups can be sharing targets, mailing lists etc. In fact, Circles are personal to the person who creates them, and there is no way to share content with someone else's Circles or to see who someone else has in their Circles. Chromebooks - Google's "thin client". Chromebooks run only the Chrome browser, on a stripped down Linux installation, with management via Google Apps. Whilst we tend to live on the Web nowadays, there are still a few native applications out there that people need to run once in a while - hence the integration of Citrix Receiver into Chrome, as shown in the demo video below. I've blogged previously about this intriguing combination of lightweight operating system at the point of use coupled with virtualized legacy applications delivered over the Internet. It's worth noting here that there are other routes to this destination, e.g. the Citrix Receiver app is also available for Android and iPad, and Ericom have reimplemented the VMware View client as an HTML5 web app. Perhaps the post-PC era really is here? For those involved in setting institutional strategy around IT and E-Learning, this is a very interesting development, and one that I shall return to in my IT strategy posts.